The Boring Company’s hole in the ground in Hawthorne, Calif., got a Hollywood-style debut tonight courtesy of the company’s billionaire founder, Elon Musk. Musk stood just outside a 1.14-mile-long test tunnel, illuminated in blue light, and spoke glowingly to a VIP crowd about how tunnels could turn the “soul-crushing” gridlock of urban traffic into a sci-fi experience. Tonight’s first tours served as a curtain-raiser for Musk’s Loop concept, which involves building a 3-D network of tunnels, elevators and ramps — and then sending autonomous electric cars equipped with retractable guide wheels zipping through those tunnels at speeds of up to 150 mph. That’s a departure from Musk’s previous idea of using custom-built “skates” to carry cars and people. 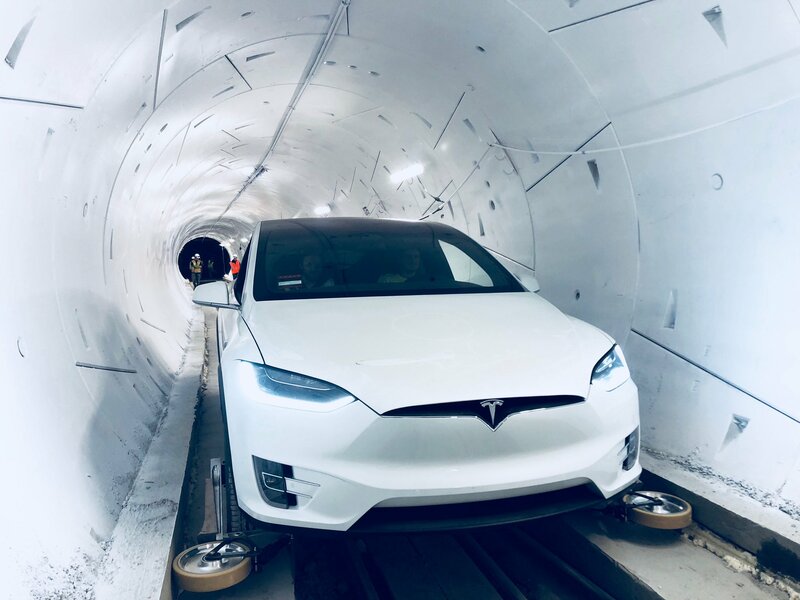 This entry was posted in GeekWire and tagged Elon Musk, Technology, Tesla Motors, The Boring Company, Transportation, Tunnels. Bookmark the permalink.